In recent years, an expanding body of evidence has linked the pollutants and man-made chemicals in our environment to cancer, declining sperm counts, birth defects and other diseases on the rise. 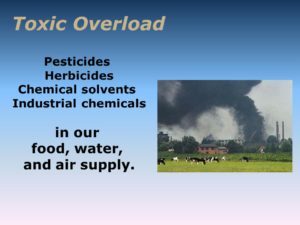 One of the biggest open questions of the 21st century is whether 144,000 different chemicals swirling throughout the world are properly tested and analyzed for toxicity. By almost all accounts, the scale of toxic risk is unknown. This may be the biggest tragedy of all time, a black eye of enormous proportions. 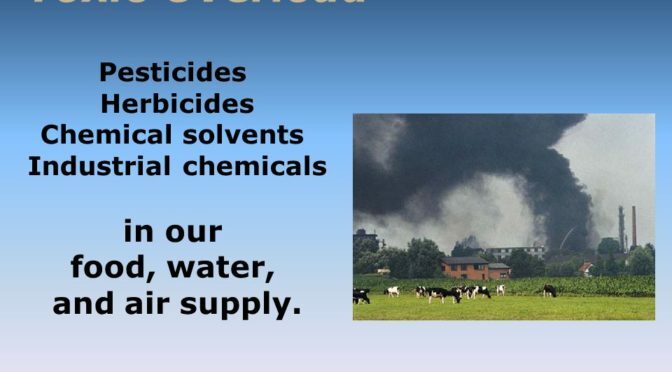 Correspondingly and very likely, not yet 100% proven but probably 99%, as a result of ubiquitous chemical presence, one hundred fifty million (150,000,000) Americans have chronic disease, including high cholesterol, high blood pressure, arthritis, heart disease, diabetes, fibromyalgia, cancer, stroke, asthma, cystic fibrosis, obesity, and osteoporosis.1 Why? Dr. Winchester was one of the researchers/authors of “Atrazine Induced Epigenetic Transgenerational Inheritance of Disease, Lean Phenotype and Sperm Epimutation Pathology Biomarkers,” PLOS, published September 20, 2017. The grisly underlying message of that study is as clear as a bell: Chemicals found far and wide throughout America alter human hormones as well as human DNA, which passes along generation-to-generation known as transgenerational inheritance. a result, goin’ kinda looney and getting horribly, dreadfully sick! As soon as the Spring of 2018, the EPA will decide whether to risk the slaughter of birds and bees and pollinators that serve critical functions in crop production, as well as goosing-up the likelihood of chronic illnesses of citizens. The issue behind this flirtation with disease, sickness, pain, and death is regulation, or lack thereof, of chemical pesticides. Meanwhile on a grand scale, and following decades of superfluity, the planet gurgles, drowning in a massive saturation of chemicals found far and wide, as high as Mt. Everest (arsenic and cadmium) as deep as PCB-infested squid in the Mariana Trench, glowing bright shiny toxicity. This article discusses only a tiny smattering of chemical madness that haunts the world yet a subject of thousands of articles of research discussing potential dangers to health of which the public is dreadfully unaware. Thus, the overriding thesis herein: Unwittingly, society is poisoning itself. Nearly every American family has a cancer victim! Chronic disease is the biggest epidemic ever faced. Yet, even though it touches almost every family, people are not tuned into this epidemic, as such, nor are the causes fully understood by the general public. It haunts society; it’s everywhere; it deforms, debilitates, and incapacitates. Is this the normal course of life or is something in the environment seriously amiss?